Launched in 2013, the deluxe MS Prestige provides all the space and comfort that you need to enjoy a first-class, intimate small cruise adventure. The modern 47 m yacht-like cruiser boasts state-of-the-art amenities and a high standard of safety features. The 20 spacious, air-conditioned cabins offer flexible double and twin bedding configurations for up to 38 guests. Public areas include an elegant air-conditioned salon-restaurant with panoramic windows, a large, partially shaded sun deck equipped with sun loungers, and a bar with outdoor terrace. On the rooftop there is a plunge pool. To the rear of the ship, a swimming platform with ladders offers access to the sea. 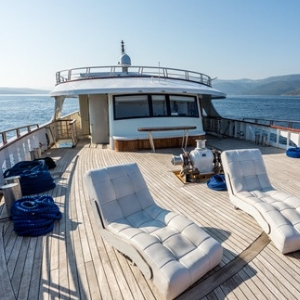 The deluxe MS Prestige is a modern yacht-like cruiser offering first-class amenities and service. The spacious, air-conditioned accommodation is arranged over the upper, main and lower decks, with standard double and twin beds for up to 38 guests. All cabins feature a private en suite bathroom and window or porthole. 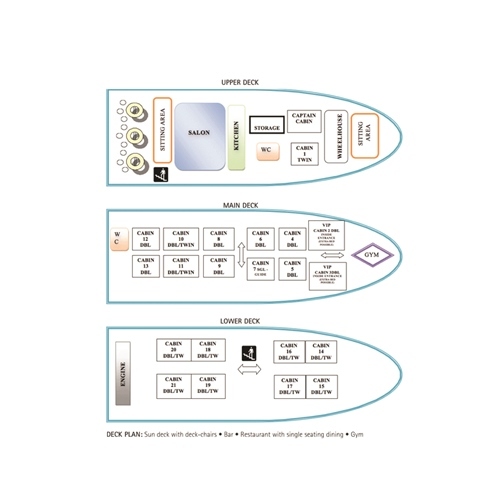 Public areas of the ship include a lounge bar with large screen LCD TV and alfresco seating. The bright, airy and elegant salon-restaurant comfortably seats all guests in a single sitting, for buffet breakfast or half-board meals. There is also a partially shaded sun deck, with sun loungers, and a rooftop plunge pool. The 20 air-conditioned cabins on the MS Prestige offer comfortable and spacious accommodation for up to 38 guests. The décor is chic and contemporary and features opulent designer touches. 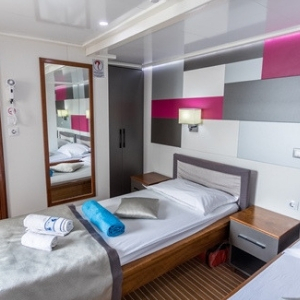 All cabins boast a private en suite bathroom, flat-screen LCD TV, wardrobe, desk, in-room safe, hairdryer and a range of complementary toiletries. Bedding configurations in the twin/double cabins are flexible for optimal sailing comfort. The standard cabins are arranged over the upper, main and lower decks and have portholes or windows. When not relaxing in the cabin, guests can socialise in the spacious and comfortable public areas of the ship. 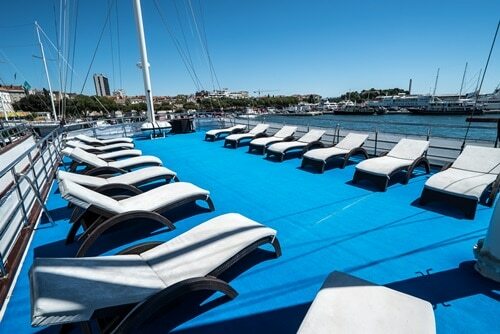 The sun deck offers an array of sun loungers and deck chairs, and ample canopy coverage should you want to stay out of the sun. 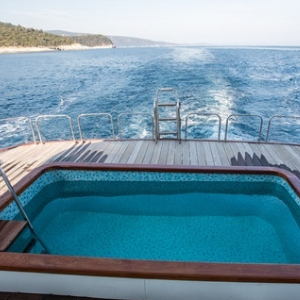 Cool off in the rooftop plunge pool, or enjoy a dip in the sea during scheduled swim stops, via the ladders on the swimming platform located at the stern of the ship. Wining and dining can be enjoyed in the air-conditioned salon-restaurant or the bar with extended outdoor terrace. Free wi-fi is also available.